I’m done with the knitting! I finished the hood last night and did sleeve 2 today! 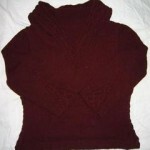 It’s happily blocking and I’m hoping I’ll be able to sew the sleeves in tomorrow. I really wanna wear it on Monday! That’s a very cool secret pal gift. I can’t wait to see pictures of your finished Rogue. 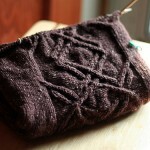 You should be excited; it will be your blog’s first FO! I’m so glad that you received your stuff safely! And found it useful. How did I figure out that you lost your gauge ruler? Just a guess – I lose mine all of the time! oh, oh oh–i think you left your gauge ruler at the SnB at my place? did you sit by the radiator? was it like a cardboard-type thing? if so, i still have it and if you’re gonna be at Stella’s for the next one, I can bring it!